Continuing efforts to conserve and restore the local Atlantic Horseshoe Crab population, The Wetlands Institute (TWI) has partnered with the NJ Division of Fish and Wildlife’s Aquatic Education Program to launch the Horseshoe Crabs in the Classroom program, which allows teachers all around New Jersey to raise horseshoe crab hatchlings and eggs in specialized tanks in their classrooms. By raising horseshoe crab hatchlings in captivity, away from predation or disease, their probability of survival to adulthood greatly increases. Through specialized permitting, TWI staff collect and hatch approximately 6,000 fertilized horseshoe crab eggs from the beaches of the Delaware Bay. Most of these eggs hatch and are released back into the bay, but others go to classrooms. Along with partners, we work to train NJ teachers receiving the horseshoe crab hatchlings and fertilized eggs on their care as well as proper set up and maintenance of their culture tank. The program started in 2016 and was a success with 150 horseshoe crabs raised in 6 different classrooms by trained teachers. The success of the program’s first year allowed it to grow more this year. 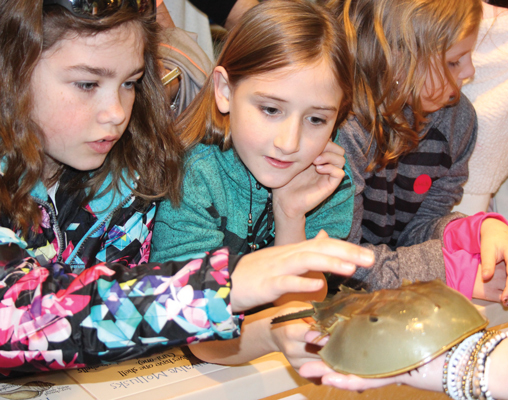 The program currently has 8 teachers taking part, each raising 25 horseshoe crab hatchlings and 25 fertilized eggs, resulting in 400 horseshoe crabs going into classrooms throughout New Jersey, more than doubling the total from last year! If you are interested in learning more about horseshoe crabs, the Horseshoe Crabs in the Classroom program, or just want to see some horseshoe crab hatchlings, come out to The Wetlands Institute and check out our horseshoe crab display and grow out tank. We look forward to seeing you!